Welcome to Wire EDM Technologies, Inc. Thank you for considering us for your Electric Discharge Machining needs. 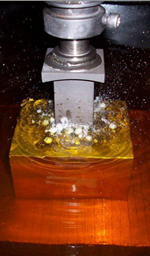 Wire EDM Technologies is your one-stop source for all things EDM. Our company has been in the EDM business for over 16 years and has the knowledge and expertise to provide all your EDM requirements. We have 12 EDM machines which are operated in a clean, climate controlled environment which allows us to maintain the tightest tolerances possible across the entire travel of our machines. With a dozen EDM machines at your disposal, we can provide all your production needs, from one to a hundred or more. Our large travel machines cut the bigger details as well. For detailed information please see the Services buttons at left. 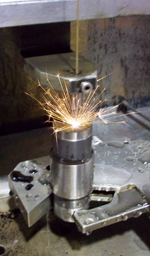 We supply machining services in a controlled atmosphere for the highest accuracy possible. © Wire EDM Technologies, Inc. All rights reserved.